Cranberry sauce, ready to be wrapped up and given away. I may not like all the traditional Christmas foods, as blogged yesterday, but I do love cranberry sauce with turkey, with ham, with chicken, with cheese, in fact with pretty much everything. In the maelstrom of Christmas and birthday prep that consumes our household in December, I am even prepared to make my own cranberry sauce. The bonus is that if you decant it into jars, and gussy them up with cloth covers, ribbon and suitable labels, they can even make presents for your nearest and dearest. It helps if you hoard empty jam jars during the year, to press into action as needed. 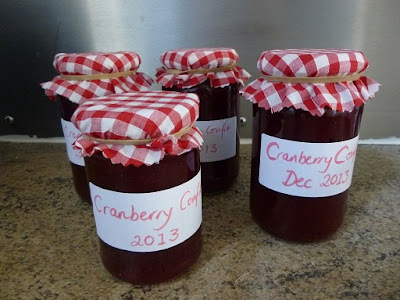 I think presents like cranberry sauce are great for people who already have too much stuff, and want something that will get put to get use, rather than cluttering up their home. Fortunately Mary Berry has come up with a recipe with is both delicious and fabulously quick and easy – always a winning combination. Mary Berry calls it “scarlet confit” which sounds a bit pretentious, but it’s worth overlooking the name. I have tweaked the quantities in the original recipe to suit the 300g boxes of cranberries on sale, so you don’t get left with random excess cranberries rolling around the place. These quantities made about 1kg of cranberry sauce, which filled 2 and a half normal jam jars. Note to self: I should start hoarding smaller jars. Zest and juice from 1 orange. Bung everything into a saucepan. Bring up to the boil and then simmer gently for 10 to 15 minutes. Don’t worry if it looks a bit runny, as it will get thicker as it cools. I use a potato masher to squash some of the remaining cranberries, as I prefer a smoother cranberry sauce, but hey you could go mad and leave some of them whole. Decant into super clean jam jars. Give away if you can bear to. Will last for ages in the fridge, due to the preserving powers of all that sugar and booze. Cranberry sauce from a previous year, on a previous work top. Where do you stand on cranberry sauce? Wouldn’t be Christmas without it, or not very keen? Do you like making the stuff, or prefer to grab a jar from the supermarket shelf? Keen on jams and jellies? Check out my attempts at “How to make cheat’s marmalade“.